PLANNING ADVICE | Hesitant to hire a planner? Why hire a wedding planner? Oh, happy day! Congratulations on your engagement. That ring on your finger, I’m sure, it has been quite fun to stare at. for. hours! And now, let the planning begin, but you have some questions. You’ve thought about hiring a wedding planner, maybe you’ve heard they can help sort through the plethora of “stuff” that surrounds planning a wedding. But you’re not sure if hiring a planner is right for you. Why hire a wedding planner? You’re working within a certain budget, can you afford one? Maybe you’re not sure what exactly they do for their clients. Can you do it yourself just as easily? So we’ve compiled a list of the top hesitations we’ve heard over the years with our explanations so that you can move forward confidently in hiring a planner that fits your budget, style and personality (all very important aspects to enlisting a planners help, in our opinion) and provide you with a fun and stress-free planning process right into a blissful marriage-hood. Weddings cost money. It’s a simple fact and most people work on certain budgets for their big day. Therefore, they assume that they can’t afford a wedding planner on top of their wedding budget. This is absolutely understandable, but here’s a new perspective. A wedding planners job is to work within your budget (within reason. We aren’t miracle workers, but we can definitely help you work within the confines of your budget to make realistic suggestions and provide efficient ways to maximize what you have to plan the day you’re wanting). They know which venues will fit your criteria, how to maximize money on décor, ways to spend efficiently on invitations, and countless other tricks that come from their experience in the field. By hiring a wedding planner, not only do you save countless hours (and time is money, right?) but you are able to capitalize on your planner’s knowledge of ways to maximize your money so that you can have more to spend in the ways you specifically want. So yes, it does cost money to hire a planner, but when taken into perspective, see how much you are saving. You are saving countless hours spent on the “not-so-fun” details and able to invest in your relationship and celebrating your love with one another instead. We’ll help create and maintain a realistic budget. You can rely on our expertise and experienced suggestions as opposed to worrying about what is the best plan of action, or spending countless hours lost on the internet reading, researching and fretting about what direction to go in. Let’s save your sanity and allow you to be stress-free throughout the process. You’ve probably known a stressed out bride just longing for her big day to be over because of all the weight of responsibility on her shoulders of the incredible amount of “things” she needs to arrange and worry about. 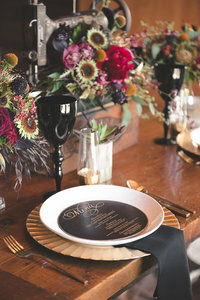 No one wants to head into their wedding day this way and a wedding planner can be just the help you need to avoid that. While there are a ton of fun parts – like assembling the perfect wedding color palate, wedding dress shopping and choosing the best wedding cake flavor (yum! personal favorite over here), not all parts of wedding planning are fun and can sometimes be tedious – like reviewing contracts, remembering payment schedules and creating your seating chart. I’m sure you’ve also already thought about what you’re wanting and would hate to have someone tell you what your wedding should, or ought, to be. But on the contrary, a wedding planner is there in the capacity that you choose them to be involved. Whether that’s to get you in the right track, sprinkling their support and working alongside you to accomplish those details big and small, or for the whole kit-and-kabootle, you decide. And a tandem sidenote is, a wedding planner doesn’t want to take any part of the planning process away from you – what would that accomplish? We’re here to support and guide you, enhance the experience of planning your wedding by making it easy, FUN and apart of the overall wedding experience. We have planned our fair share of weddings, taking over yours for the sake of taking it over is never our idea of fun. Trust me when I say I find much more enjoyment collaborating on a day that is perfect for you, than planning my own version of your wedding. Here at ESW, we customize all of our packages to fit your individual circumstances, and quite frankly no two of our events are the same, since no two of our couples are the same – isn’t that fantastic? We think so. In fact, we believe your experience planning your wedding is as important as your experience on your wedding day. We pride ourselves in creating an experience for you that is unique, and centered around you, your preferences + your priorities. We’ll handle the boring bits, the tedious tasks and provide the support and guidance based on our extensive knowledge gained from experience to maximize the fun with the piece of mind knowing all details are well taken care of. Organization and timely execution of life tasks and responsibilities are excellent qualities to have and they will help you in planning your wedding. But organization is not all a planner can do for you. Logistics and assembling a timeline rooted in experience from executing hundreds of events, can only benefit you, #amiright?! Having a sound back up plan and someone there to manage the flow of the event and (sometimes) navigating and correcting missteps or uncontrollable circumstances with the least impact on you and your guests, is invaluable to your stress-level and overall enjoyment on wedding day as you begin the start of your marriage. Not to mention the experience your guests will have on your wedding day, (Read more about creating the best guest experience) we’ll lend a hand in making suggestions for the best flow of events. Ut oh! Your mom’s corsage broke after hugging cousin Albie; not to worry – we can fix it (or make a new one). We can help with your overall design, creating the cohesive atmosphere. We can be your sounding board for the idea you’ve been contemplating since you’ve been engaged. We can be your research engine – let us do the hard work and spend the hours collecting information, cataloging your website and providing resources for your guests to explore, and presenting you with the best choices for venues, vendors and options. And while Google knows a LOT, it doesn’t know everything. Take advantage of ESW’s 10 years of local Colorado mountains knowledge and resource bank when it comes to local hot spots, fun things for you to experience on your wedding weekend with your family and friends. Need a neutral, third-party buffer for your bossy Grandma Mitzy? We can do that too. We can wear many hats to ensure your planning experience is not only productive and organized, but also relaxing, refreshing and easy! We want you to enjoy this journey, this adventure! We’ll assist how you need us to. Hiring a wedding planner is not meant to rob you of any experiences, but to free you up to enjoy the process and experience joy as plan such a momentous occasion. Let a planner accomplish those tasks that seem overwhelming, tedious or just plain boring, we’re happy to take that off your plate. Whether you want someone to assist with every last detail for your wedding or just want help in 1-2 areas, with the right wedding planner you can have the perfect teammate helping you reach your goals and relieve you of unnecessary burdens heading into one of the most beautiful days of your life. Allow us to share our experience, sometimes we have learned the hard way, local knowledge and dedication to giving you a personalized experience, laced with our passion surrounding planning an event that represents your love story and our commitment to be your voice of reason and solution-finder. Ready to embark on your Colorado Wedding adventure? Let’s continue the conversation. We can’t wait to hear from you.